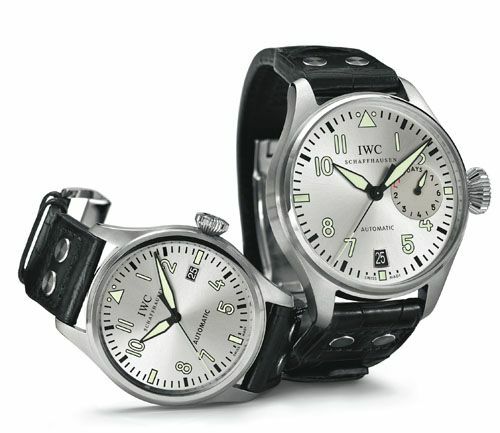 2012 was IWC’s year of their Pilot’s watch. The introduction party of the new Pilot collection during the SIHH in Geneva last year has been topic of several discussions. Whether it was positive or not, at least IWC got everyone’s attention for the Pilot collection. Here in The Netherlands, we had our own introduction day of the new IWC (TOP Gun) Pilot collection. A report of that day can be found by clicking here. Before I started working for IWC, I’ve been active for a lot of different industries. I almost had seen every type of product except cars and watches. It was actually by coincidence that I ended up in the watch industry. What struck me most – besides the watches – is that at the basis of these products is a company with a long history which does everything by themselves from design to the actual production process of the watch. That’s very special in this era. However, my team and I do more than watches only. We have a team of 12 designers in Schaffhausen and 5 of them are constantly working on watches. Other members of the team work on our IWC boutiques, packaging, gifts and basically every visual aspect of IWC. However, the watches are our center point of attention. Compared to the products I’ve work with before, watches are certainly the most emotional products. It’s just wonderful how involved our customers are with our products. Everytime I talk to IWC collectors, IWC fans or to the people who visit our museum in Schaffhausen I am amazed how emotional they get about our brand. It really fascinates me and gives me a lot of input in my work. It shows that it is more than ‘just a watch’ to people, some people live for watches. I live for watches. On to the watches. The Pilot collection has been IWC’s focus in 2012. 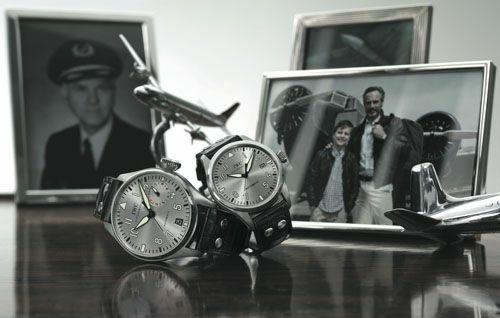 Let’s start with the new Pilot Father & Son watches that were introduced in 2012. The Big Pilot (Father’s watch) is an iconic watch already and has its own group of followers. Wasn’t it hard to change certain things about this watch, such as the black dial? For the Father & Son Pilot collection, we decided to use different colors for the dial and Super Luminova. We also decided to produce both models in stainless steel (as opposed to the platinum & steel set from the previous collection), as we’ve learned that this combination should become affordable for more customers. As the Father Big Pilot watch is based on an iconic watch and only little could be changed, what was the biggest challenge for you designing this watch? With regards to the Father & Son watch, it was only a minor change. However, if we look at the entire Pilot collection of IWC, it is one of the oldest collection of IWC with a very specific design code. There is a lot of heritage in this Pilot collection that we need to embed in new collections. We also decided to embed more in-house developed movements into the Pilot collection. Basically, we have three sub-collections for the Pilot collection. We also took the opportunity to divide the Pilot collection into three sub-collections: the classics, the Spitfire and the TOP Gun collection. The Spitfire is the more elegant line-up of watches where the TOP Gun collection will be the more ‘premium’ line-up with manufacture movements. We will be expanding this concept in the coming years. With regards to the TOP Gun collection, we’ve used our heritage as manufacturer of military watches in the past. With the Miramar, we clearly grabbed back to observation watches from the past. We also used a military color-code for this particular model. How about the classics? The Mark XVII and the Flieger Chrono? Both models have been redesigned in 2012. We changed the dimensions and proportions a bit and enriched the watch with more details. These watches have grown-up a bit due to these changes. We also offer a wonderful new stainless steel bracelet for these watches with high quality finish and micro adjustment. The classic Pilot watches turned into a very refined product. Do you look at watches from other brands? Yes, of course. You can’t do this job without looking around. If you are working on a product, you’re also looking what’s happening elsewhere. It can be very interesting sometimes. You’re not afraid that it will influence you too much? No, not at all. We have our own philosophy and all of our collections has it own design codes. We’re not afraid to look around to see what others are doing, but if brand X for instance comes up with a brown colored watch, it doesn’t mean that we also are going to do that. To me personally, one of the biggest sources of inspiration is our own archive at IWC. There are really some treasures in there. Some watches from our own collection in the past were quite extreme, but very inspirational. If you would get a ‘cart blanche’ to design a pilot’s watch, would it be very different from the Pilot? Perhaps it would be a slightly different watch. However, I think that the quality of the design is not an issue any more. Today, the quality of design is very high. The biggest challenge is to create identity. Identity is very important to differentiate from other watches or brands and to give the watch a certain character or structure. To make sure it represents IWC and isn’t just a nice watch. 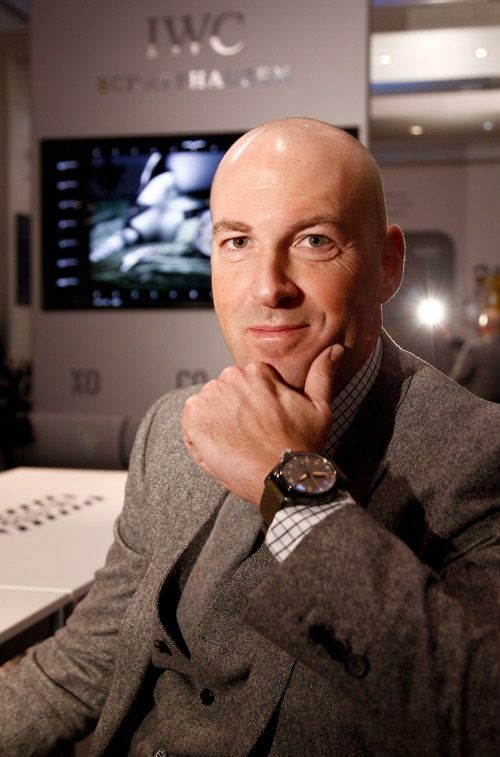 To what extent do you listen to your customers or IWC collectors? It is very important to listen carefully about the comments that are being made. Are they related to a personal opinion, like “I don’t like the color” or “that watch is too large or too small for my wrist”, or is it a comment that can be very relevant for us. For instance, when I go on-line to visit watch blogs and see there’s an opinion about the character of a watch in relation to our brand name, then this can be certainly inspiring to me. Especially when I see that more people are sharing this opinion.